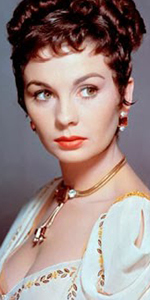 Jean Simmons was a tremendously gifted actress, who began her career in films in her native Britian, but was among the first to make it Big in Hollywood at the beginning of the CinemaScope years. Born in a northern part of London, Jean's father was a bronze medal winner in gymnastics at the 1912 summer Olympics in Stockholm, Sweden. Jean was the youngest child, with two older sisters and an older brother. During World War II, the whole family evacuated to Winscombe, in Somerset. Jean and her older sister Lorna used to sing in the village together. Upon returning to London, Jean enrolled in the Aida Foster School of Dance, where she was spotted by director Val Guest, who cast her as Margaret Lockwood's hotel maid in Give Us the Moon (released in July, 1944). She was signed to a seven-year contract by Gabriel Pascal, the only person who had been able to get the screen rights to the plays of G. B. Shaw. Simmons had a small role in his film of Caesar and Cleopatra (released in December, 1945). After that, she got the plumb of playing the younger Estella in Great Expectations (released in December, 1946); played an Indian girl in Black Narcissus (released in May, 1947), and took the role of Ophelia in Laurence Olivier's film of Hamlet (released in May, 1948). She was nominated as Best Supporting Actress for this picture. In 1949, Jean Simmons was a very well-known movie star in Britain. She starred with Stewart Granger in Adam and Evelyn (released in July, 1949), and married the man. Somehow, she found herself working under contract to Howard Hughes, for whom she did Angel Face (released in January, 1953), among others. Simmons had to sue Hughes in court in the U.S. to get free in 1952. M-G-M beckoned. They put Simmons as Queen Elizabeth I with Stewart Granger as Thomas Seymore in Young Bess (released in May, 1953), and filmed with Spencer Tracy in Ruth Gordon's memior film The Actress (but it was released on the same day as The Robe, in September, 1953). 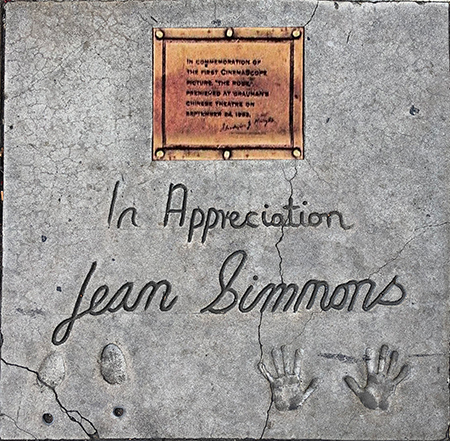 Simmons was asked to place her hand and footprints at the Chinese theatre the afternoon of the Hollywood Premiere of The Robe, since she co-starred in the film with Richard Burton (the first CinemaScope film would play the Chinese from September to December, 1953). Simmons' block originally had a golden plaque commemorating the premiere of The Robe, but it has long since been stolen. Simmons was a busy actor. She got top billing in The Egyptian (played the Chinese in September, 1954), played opposite Barlon Brando in Désirée (which played the Chinese in November, 1954), then co-starred again with Brando in the musical Guys and Dolls (released in November, 1955). Simmons co-starred with Gregory Peck and Charlton Heston in the epic western The Big Country (released in October, 1958), then, for a changeup, she played a recovering mental patient in Home Before Dark (released in November, 1958). It was while working on the film Elmer Gantry (released in July, 1960, that she divorced Granger and married her director, Richard Brooks. Perhaps her best-remembered role is as Virinia opposite Kirk Douglas' Spartacus (released in October, 1960). Her grace, control and comic and tragic nature grounded the picture in very human terms. She's just great in it. Everybody is, but Simmons takes the cake. Simmons had her first taste of southern conflict in All the Way Home (October, 1963), and teamed up with husband Richard Brooks' original screenplay, The Happy Ending (December, 1969), which became her second Oscar monination; but for Best Actress this time. In the 1970s, Simmons toured the U.S. in the musical A Little Night Music, then took the show to its premiere in the West End of London. She played Desirée Armfeldt for three years. In 1983, she played the matriarch in the television movie of The Thorn Birds, broadcast over ABC in March, 1983, and for which she would win an Emmy. Two years later, she would take on the same sort of role in a television movie about the Civil War, North and South, Book II, broadcast on ABC, in May, 1986. She appeared with Anthony Hopkins, Hugh Grant and Trevor Howard in a film about the Irish rebellion The Dawning (released in August, 1988), and in a turnabout, played Miss Havisham in a British television version of Great Expectations, broadcast over ITV network from July to August, 1991. Simmons guest starred on Star Trek: The Next Generation in syndication in April, 1991, and had a role in a re-boot of Dark Shadows in 1991 also. She narrated a documentary series for A&E called Mysteries of the Bible, and did the English version voice of Gramda Sophie in Howl's Moving Castle (released in September, 2004). After a life-long struggle with drugs and medications, Simmons became the patron of the charity Release, and became active in decriminalizing marajuana. She died of lung cancer at her home in Santa Monica in January of 2010. She was just nine days short of her 81st birthday. Grauman's Chinese Theatre, Hollywood, California. Jean Simmons Forecourt ceremony, Thursday, Setember 24, 1953. 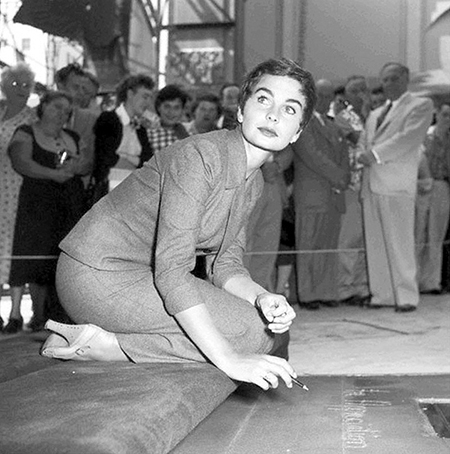 Jean Simmons pauses just before inscribing her autograph in the cement.